Free breakfast, wifi and parking. You take care of the riding; we'll take care of the rest. 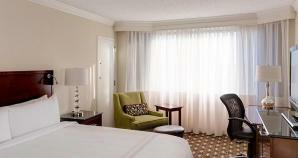 The Tyson's Corner Marriott, is the ideal place to call home during Rolling Thunder. Be sure that promotional code L9Z appears in the Corporate/Promotional code box when making your online reservation, or call 1-800-228-9290 in the US and ask for promotional code L9Z. For toll-free numbers outside the US please click here. Terms and ConditionsValid seven days a week through 5/27/19. Limited number of rooms are available for this promotion. Tax is additional. Offer does not apply to groups of 10 or more rooms. Offer cannot be combined with any other promotions. Blackout dates may apply. Advance reservations required. Other restrictions apply. Rates are per room, per night and based on availability at the time of reservations.